When I sat down to review SereniGy and research the events leading up to its founding in 2009, I soon realised that there was far too much source material to include in a standard BehindMLM review introduction. In addition to that, I was unable to find any single source (or even a few sources) that collectively addressed the events leading up to the formation of SereniGy. With a mountain of browser windows open and fast approaching two thousand words, I made the decision to extract this particular series of events and do a separate writeup. What you will find below is a largely unedited telling by Jay Noland (also known as James Dwight Noland and JD Noland), describing what took place before he went on to launch SereniGy. Noland (right) referred to the two phonecall teleconferences he held in late 2009 as the “Truth Sessions”. I’ve included information from additional sources, including a rebuttal from those Noland accuses and what I was able to find by way of court documents. Noland’s story is one of betrayal, infighting, secret alliances and an example of the complete breakdown of executive communications behind one of the most widely recognised companies in the MLM industry today. In my research I was surprised to find a lack of cohesive information on this subject. Bits and pieces of what went down are scattered all over the place, but there wasn’t any definitive source(s) covering this particular timeline of events. Feeling that it would be impossible to write a SereniGy review without including this information, I took the time to put it all together. Not only to be included as an appendix on a later BehindMLM review of SereniGy, but also for future reference. Foreword: Below you will mostly read the words of Jay Noland, as spoken on his Truth Session phonecalls. It is to be wholly acknowledged that these are his version of the events that took place, but also that no alternative, other than the limited disputing of specific claims Noland makes via filed court documents, appears to exists. To the best of my knowledge neither Bernie Chua, Shane Morand, Jamie Foo or Holton Buggs have ever spoken publicly about the breakdown of their partnership with Jay Noland within Organo Gold. [31:44] Everything I’m telling you guys is documented. It’s not something that’s theory, I’ve got (it) documented. This is the series of events that went down. Following Gano Excel, in 2008 Jay Noland co-founded Organo Gold as a “minority shareholder” (according to court-filed claims made by his partners), and co-master distributor with former Gano Excel executives Shane Morand and Bernie Chua. [21:45] That’s how the entity (Organo Gold) was created, with us three sitting down and coming up with it. [21:50] The deal was that Bernie would provide the infrastructure… Shane and I’s job, our deal was that we were going to bring the sales. And so what Shane and I said from day 1, because we saw the failed position with what happened with Bernie’s relationship with Gano Excel, so what we decided was “Hey Bernie, and Shane would say this all the time to me, “Jay, we need to protect Bernie from Bernie”. And I never could understand first why he said that. So I said “why?”, he said “because, we just gotta protect him from Bernie. You know he because of this, because of that”. I said “oh ok”. [22:52] So I said “well that’s what we’ll do. So the part of the deal was Bernie, we’re gunna bring the sales and you handle the infrastructure. “Yes, no problem” Bernie said. So that’s how the deal was set up. [23:35] Bernie said, he told us, that he had a five hundred thousand sales team in the Philippines. He said “Well when we do this, how this is gunna work, is that we all were gunna partner in the top business center of Organo Gold”. So we would all partner and share in the income generated through the business center. So that’s how it was set up. And the reason Shane and I agreed to that, was that Bernie said he was gunna provide a blow-out leg from the Philippines. We thought “man, that’s a great deal”. So what we all decided was Bernie could keep the largest percentage of the company, but we’d also let him share in the business center – based upon having a blow-out leg in the Philippines. Personally I’m not a fan of MLM company’s competing against their field (or creating executive positions at the top of compensation plans). I think if an MLM company can’t survive on pure sales revenue (external to the compensation plan), then there’s probably a flaw within the compensation plan itself. [24:40] So we began to sit down and do our draft. And first how it was going to set was… Philippines on the left team and we were gunna have the North America team on the right team. So we began to do a draft. [25:14] We asked Bernie how the software was coming along and he had a guy hired that was over, supposed to be having the software put together. So we looked over and said “can we kinda get an idea about what’s going on the Philippines thus far”, because he was supposed to have already gone into a prelaunch, even before we got Organo Gold prelaunched. And so we asked Bernie. He said he’s working on it, he’s gettin’ together, he’s meeting with leaders; and I was like “Woah. This is something else and I don’t see a lot of action here”. [26:03] So we go on and uh just put our hands down. But then I say “Shane, I got a feeling that we should not put all of North America on one side because I’m kinda sketchy over what’s happening in the Philippines. I don’t know what’s going on over here”. So Shane said “Yeah we probably have”. So we adjusted, I’ve still got it on paper, we had to adjust it and put some of the folks on the first round over on the Philippines side, and then we went ahead and started building. Then Shane come up with the idea, he said “Jay, we’re gunna have a “Healthier Coffee Day” on June 12th, 2008″. And I said “That sounds awesome! I like that concept”. I said “Shane what we can do is use the system to create cooperative marketing. We can have events posted up where everybody can post events and everybody can know where everybody’s events is going on to support the team”. [26:55] So we started putting that together. So we go back to Bernie, we say “Bernie, we need the software to be ready. Can you meet the deadline? It needs to be up by June the first”. So finally after a couple of days of trying to get a hold of this person, we finally get a hold. and then we get Bernie and this gentlemen to give us the password so we can go look at the system and find out what’s been put together. When we go look, guess what we find out? Hardly anything has been put together. That put us in a panic because we had all of these people, some of you know who you are, you had our word on this deal. You had our confidence. [28:12] Here’s the deal guys. We said “Whatever we said we were gunna do, we gotta do it”. That was the law. That was my agreement with Shane from day 1. And these people were banking on us. Three of four days into the month and still, no software system up. Finally we get a hold (and) I tell them. I say “you guys gotta get an IT guy in here who knows how to do this. Bernie who do you have?” He goes “Oh I don’t have anybody.” “Shane, do you have anybody?” He couldn’t think of anybody. [29:04] He came in and he worked tirelessly, and I give him all the credit in the world for that, working around the clock. And he put things in a position to where we could at least have a shot. But we had this June 12th staring us in the face. [29:56] So we don’t have a merchant account to even process the orders to even get the product to the people. After all this time. And we ask Bernie “How long you been working on this?” “Several months.” He said he’s been working on the process. So we then go back, and rewind a little bit, when we were having to come up with the design, Shane had got us some proposals and people were wanting multiple tens of thousands of dollars, just for a logo. And so Shane, he was coming to me “Do you know any people?” And I said “Well my friends Dwight Drane and Michelle Adderly, they have a print-design company down in Miami. “We will give it a shot and here’s what we’re gunna do. We’re not gunna ask you for any money upfront at all. All we’re asking is if we put this together, if we do this… that we be given the rights to be able to, uh have the exclusive rights to market the sales materials to the team. Well they did it. Now I think it was their second or third design they went into, and that’s the logo you see now – the Organo Gold logo. That was Michelle Adderly and Dwight Drane who said that. They stepped up. Dwight spend an entire day on the phone… getting that set up . Then we finally got it, and we started to run and process the cards. Now guess who ran processed all the cards manually? The voice you hear, Jay Noland. I stayed up late into the wee hours of the night processing cards. I was exhausted but I got it done. I then put the orders together, got the files back over to Bernie to say make sure that he could get express mail to get the product out to the people. To where they could have product for their Healthier Coffee Day events. Because we ran so close, up to the last second, some product got held up at the border and guess what? Half the people didn’t have product for their Healthier Coffee Day. And right there, that killed a lot of momentum and a lot of trust and credibility with the people we had brought to the table. Shane Morand knows this to be true. But still yet, Shane Morand, Jay Noland we stood there and we edified and we promoted Bernie Chua to the fullest. And everybody on this phone that was there knows it. So even though we felt we were let down, we continued to promote and edify – hoping that he’d grow into that edification. So we kept on going, and as time went, we had one things guys after the next, after the next, after the next. Given Chua’s alleged track record on the MLM executive side of things, I have to say the penny should have dropped that things with Chua weren’t going to change. Noland goes on to peg much of the success of Organo Gold to what was mostly his efforts in affiliate marketing support, customer service and compliance, organizing affiliate training summits amongst other things. [37:53] As this company’s progressed over the past year and a half, I’ve had to be intricately involved in every aspect, virtually every aspect, of the company – to make sure that what? That we’re able to take your orders, that you can have product shipped out to you. You guys don’t know about the issues with shipping behind the scenes… that I’ve had to jump in to get fixed. What about making sure that you get paid on time, I’m relentless when it comes to making sure that you guys get paid on time. And any time that paycheck was late, I’ve got the email documentation to prove that I’ve got emails shooting over to support, to Bernie – “The people have to be paid on time!” We told ’em, it has to be! [38:53] I put my sweat, blood and tears – countless hours, sometimes sleeping two to three hours to make sure you’ve got a platform to able to come and build upon. [40:25] I had an opportunity to speak to an individual that I trained, initially trained, that took my marketing material, all the way back in 2000, took that material and, at the time the gentlemen, you all know who he is, his name is Holton Buggs, was able to give him information to allow him to jetset his career off. Now I didn’t train him in everything he knows, never have claimed to say that, but (I) put him on a path to where he could go out there and give him a platform to where, instead of being $250,000 in debt as he says, instead of being 45 days away from foreclosure as he says, instead of having his car repossessed as he says, instead of that being the focal point – give him platform and training information and inspiration – what price do you put on the inspiration? – to get you to become, and the belief that you put into a person, to get them to become who they really need to be. To instill that confidence in that person so that they can go tear it up. And I tell you what, he went out and he tore it up… he was able to make millions of dollars. Buggs will go on to play a major role in the next part of Noland’s story, with Noland ultimately crediting Buggs and Bernie Chua with conspiring to “undermine” and eventually remove Morand from Organo Gold. [41:40] I was so proud of him (Buggs), I bragged on him – never said one negative word about him. All that time he was out there doing his thing. Called me over the years, asking for advice, I talked to him, we would chit-chat. Y’know how it is. And I said “You know what? This coffee is gunna be your way out.” And I said “But I would have expected, Holton, that at this particular time in your career that you would either own your own company, or be a master distributor of a company. That’s what I would expect for you to do. That’s what I would suggest you do at this point. And he says “alright.” I says “But you gotta understand one thing coming in Holton, coming in (and) because of our setup here, because we don’t have strong customer service we gotta be low-maintenance. So we got three things we can’t abridge. We cannot go against… we can’t have disparagement happening within the company. Can’t have negativity against the company or people in the field – can’t have it. “I understand that” he says. Whether this was an indictment of Bugg’s behaviour in past MLM companies as an affiliate is unclear, but they did strike me as rather odd things to categorically point out cannot happen prior to signing someone new up. So he come here and of course, with any (new) situation he gunna have distributors who don’t understand the rules of the game, they’re gunna come in and do some of this and do some of that – and you’re gunna have distributors violate policies and procedures. Now all that simply has to happen is the company has to address it. The company has to enforce their policies and procedures, or else the policies and procedures are null and void… so we went ahead and did that. Okay we talked it out, so we go our way. The next thing I know is somewhere around November or December of last year, somewhere around this time, next thing I know, Mr. Holton Buggs who had already came in, made a big splash, already had the company paying him checks on time, had the company taking his orders – him and his people, I find out that Holton Buggs takes a trip to go visit our chief competitor Gano Excel in Malaysia. Can you imagine how Shane Morand, who had been terminated on a (Gano Excel) conference call on May 12, 2008 – can you imagine how Shane Morand felt? Can you imagine how I felt? Having done all this to get this baby off the ground? Can you imagine how we would have felt to find out that our top distributor is went on a plane and flew all the way to Malaysia to go visit our chief competitor? Then can you imagine for us to find out that our top distributor has called most of his key leaders on a conference call, and began to try to persuade them to the effect of going to our chief competitor. Can you imagine how Shane Morand felt? Can you imagine how Bernie Chua felt? Can you imagine how I felt? Can y’all imagine that? I told Shane, I got a feeling Holton’s done this… but I couldn’t prove it at the time. Then I got evidence that he’d done it, and Shane’s remarks to me is “terminate him”. He probably said it to me about five times: “Terminate Holton. If he infact did go to Gano Excel to visit them and to entertain them after we’ve done what we’ve done… Jay, terminate him.” That’s what was said, and I don’t think anybody could blame Shane for feeling that way. The evidence Noland mentions appears to be a recording of Buggs conference call with his leaders. Noland however only presents this evidence as a hypothetical “what if”, he doesn’t actually confirm whether he has the recording or not. [48:00] I was sick to my stomach, I know Shane was about to throw up but I know one thing, I allowed Holton to speak his piece. And what I got from some of the leaders, before he’d even talked to me, was that he had severely disparaged Bernie Chua, our CEO at the time. Stating that Bernie did not have the capital and the funds and the infrastructure to pull this off. And so he (Buggs) completely discredited the company in a major way. But I let him go ahead and get it all out. And he said “Jay I’d like to be able to communicate more with you,” and I said “Holton you gotta understand, I would love to communicate with you as much as you would want communication… but I’ve got a big bear of this company on my back right now that I gotta make sure stays open. I got the recording of that. Where he’s (Buggs) publicly said “I’m a 1000% back to back”. Holton ultimately dodged the termination bullet, and remained in Organo Gold as the company’s top-earning distributor. Citing “discord” and “issues” at Organo Gold events in Miami, China and Jamaica, that the situation with Buggs did not improve. [51:25] Then I find out that our CEO, against our agreement, Mr. Bernie Chua began to collaborate and participate in the de-edification of me, his partner. It put the entire company in jeopardy when that happened. We got on the phone with Bernie, we called Bernie up. We said “Bernie, here’s what’s going on.” Bernie did not deny it – that he was in communication and talking to Holton at that time. This is several months ago. Well, didn’t hear anything. Nothing. Despite the uncertainty, Morand and Noland continued on with their Organo Gold corporate duties. Eventually another meeting with between the three partners was scheduled, with Noland was under the impression that the meeting would be private. [53:50] Then we fly up and we (Morand and Nolan) have a personal meeting scheduled with Bernie Chua, in Vancouver. So we fly up there, and I think it was on October 1st, and our meeting is set. Bernie sends a communication to me that it’s going to be a shareholder’s meeting. That wasn’t the agreement. The agreement was we were gunna have a personal meeting. I sent Bernie back an email, I said “Bernie no I don’t to have a shareholder’s meeting first, I don’t mind having one but I first want to have a personal meeting. So I get there, we sit down and I’m like… I come to the meeting, hoping to have a personal meeting – we get there and he says I’m going to invite Jamie Foo (a silent investor in Organo Gold) through… to conduct a shareholder’s meeting. [55:15] I don’t really know what to do at that point. All I know is I’m feeling trapped, I’m feeling coerced and I’m under duress. It’s what you call threat, duress and coercion. And so I don’t know what collaboration is going on at that time, all I know is I’m uncomfortable – I don’t know what to do, what not to do. So I try to make the best out of it, I was completely uncomfortable. We go down, Shane make a little stance and he tells Bernie “You know what?” Because Bernie made some comments, he said “that the field was artificially enthused at our summits. That people didn’t really like the raining summits.” That’s what he told Shane and I… and I tell you what, it made us feel like absolute crap. And it dug a knife in my heart that I’m telling you, I can’t believe what I’m hearing. I said “Bernie, all the holes you put that we’ve had to plug for you over this past year… you want us, you truly are telling us that you want us to now trust the fact that you’re gunna put somebody else from corporate to handle the summit? That’s not part of the deal. [57:40] So, in our agreement (at the meeting), this matter, I stated emphatically and we said we’d revisit it and we were going to conduct another meeting to revisit the issue. [59:20] So I get back and I’m going to work – and the next thing I know, I get a couple of messages… about a Vice-President of Marketing. I get told “Guess what, there’s a marketing person that Bernie’s interested in. I don’t get told that by Bernie, at all. I get notified that by Shane. Now you guys gotta understand, that over the first year every single thing we did pretty much we all collaborated with eachother, and we all inputted and then we all put our little vote in and said guess what? Yes or no. All of a sudden I get notified by Shane that he’s had a meeting with the particular person, her name is Carla Segato. Shane thought he was having a meeting with a distributor, he shows up and finds out that Bernie has a meeting with the potential Vice-President of Marketing. After some missed calls back and forth, eventually Noland meets Segato over the phone. So she’s already been hired without my knowledge. We never made any decisions like that in this company, we all collaborated on the decisions. And I’m going “Wow!” How would you feel? I was just respectful on the call, I said I’ll get back to you I need to talk to my partners. I was upset. So then, some emails go back and forth with Bernie, as you can imagine you know, I’m upset. And then we have a series of events that takes place… that’s ridiculous. So Bernie and I talked, and we come to an agreement on the phone over how things are going to work. Part of the agreement was, guess what? Shane and I will run the summits, and I said we’re gunna give Carla a shot – give her a chance to do the best job she can do. The next morning an email goes out to all the staff saying “Great news”, and he (Chua) introduces Carla as the Vice-President of Marketing and says she’s going to be redesigning the logo, she’s going to be redoing the branding and taking over summits. [1:03:25] The night before we didn’t work that out, the next thing I know that’s now worked out. So you can only imagine how I felt. I then get on the phone with Shane Morand, we have a conversation and I start to bring up improprieties that have taken place. As Noland goes on, one gets the sense that this next perceived betrayal is the one that cuts deepest. [1:03:47] What happened guys was this. That Shane and I, we had some words go back and forth and what I said, I said “Shane you are not back to back with me.” And guess what? I used some strong language and I got upset. Shane hangs up on me, his partner who was there for him when he got terminated from Gano Excel. Remember those times? My heart was ripped out, because I’m wondering “What in the world would make Shane, even if we have a misunderstanding, even if we’re having a heated conversation, what would make him get to the point…?” He just hangs up on me, and then decided not to call me back at all. And hasn’t talked to me, hasn’t called me, hasn’t communicated other than one time via email, that was a nasty email towards me. Hasn’t done it. Just imagine guys, how i felt. It didn’t feel good at all… but what do I do? I keep edifying Shane, I keep edifying Bernie. And I get on a conference call with Bernie, we had a shareholder’s meeting conference call. I asked Bernie why did he decide to make these changes and he said it was in the best interests he felt of the company. I said “Bernie, we had an agreement.” I said “You know what? For all that I’ve done here, that ain’t right. So here’s the deal Bernie…” At that moment guys, that’s when I offered Bernie to buy his shares in Organo Gold and/or accept a retirement package. Because I felt at that point he had not done what was in the best interests of Organo Gold. [1:05:45] I got off the phone and Bernie asked me what I would take for my shares and I asked him what he would take for his shares.. and we said we would think about it get back (to eachother) in a couple of days. I was ignored. I continued to do the conference calls. I continued to get out there and do the meetings. I kept edifying and promoting them (Morand and Chua). No communication. I sent several messages, no communications. None. Now at this point you can imagine how I’m feeling. The next thing I know, I’m locked out of the conference calls. The next thing I know, I’m locked out of everything. Noland claims that during this time he was trying to talk to Morand and Chua about his discovery that the Ganoderma used in Organo Gold was not what it was purportedly advertised to be. [1:07:10] When people say “Man that coffee makes me feel good,”you know when people say that? “Man that coffee makes me feel good!” What have we been training people to say? People say “Man it’s not the coffee, it’s what’s in the coffee.” And the statement that my partner Shane Morand coined was, “It’s the 100% certified organic Ganoderma.” And Shane goes on to talk about the multiple awards that the Ganoderma has won. He talks about all that, right? So my question to you tonight, is what is it that you’d think, so in our coffee, in our hot chocolate, in our mocha, what Ganoderma do you think is in those prouducts? What do you think is in there? And being that we have the Powerpoint that shows that information, that shows about our partner over in China, that shows all the awards, what would one be led to believe is in there? All of us would be led to believe that it would be that particular source of Ganoderma. I approached Bernie about this several months ago, and he kinda headballed around a bit but then he said “No, it’s not that Ganoderma.” See guys, that’s what you call “deceptive trade practices”. That’s deceptive trade practices right there. I did ask Bernie, I said well if it’s not that, is it organic? He said “Yes.” I said “Bernie please provide me with the certification letter so that we can provide it to the people.” As of this date guys I still don’t have that certification. I said “Doc, I know! I’m waiting on a response from Bernie Chua and it was an issue I wanted to bring up with him as part of the issues but they refuse to talk to me.” He and Shane won’t get on the phone with me. So the people who out here promoting the product, promoting it in a way, in a deceptive practices manner – they don’t know it. That’s a major problem, on its own that’s a major problem. And so this literally freaked me out and I kept trying to get communication. Dr Bartell of course is majorly concerned, he’s bringing on other doctors that are gunna be testing as well and everybody’s credibility is at stake. Do you understand how government agencies will look at such a thing? [1:10:45] Then I found out I’m locked out of the software system, the overall company system. I’m locked out of what? My own backoffice system which I partially own. At this point, Noland called the lawyers in. [1:11:15] Then I had to get my attorney involved, to protect your interests and my best interests… because I saw things happening. Then all of a sudden guys, what happens? Our compliance officer, Mr. Morgan Tharpe, he makes me aware that he’s having to investigate this because I’m a co-founder of the company and I have a right to know what’s going on out in the field because I’m in charge of the field as well as with Shane. Shane has a right to know. But Shane then can’t get any knowledge about it, why? Because he’s not responding. Well, guess what happens guys? Morgan goes to investigate Holton Buggs, and Bernie knows this to be true, when Morgan begins to investigate the situation, he then gets fired and terminated from the CEO, Bernie Chua – without reason, without excuse. [1:13:40] So then what do we get? We get an announcement that last week, the Vice-President of Sales announced is… Holton Buggs. So now I’ve put the pieces of the puzzle together – the whole collaboration. The whole undermining took place between Bernie Chua and Holton Buggs to undermine me. Now I understand why when I did the meeting in Houston, Holton remembers this, you remember Holton if you’re listening in, you remember the meeting you and I had in my suite after that awesome night we had… you remember the conversation we had? Well I was straight up with you – I addressed you directly on my concerns. I told you as a man face-to-face how I felt. Not ever edifying, not ever bringing you down – always building you up. And now I understand why Holton said, “Y’know, I never wanted to hurt you and Carrie.” That was the words that came out of his mouth in that suite. Now I understand why he meant that, because he was participating, in my opinion, in undermining me and my position in this company. A few days before Noland made his first “Truth Sessions” call, Bernie Chua released an official statement to Organo Gold affiliates. In it, Chua refuted Noland’s claims and labelled them malicious, mean-spirited and unfounded. 1. To my knowledge, as of December 2009 no lawsuit has been filed against me personally or against Organo Gold. 2. 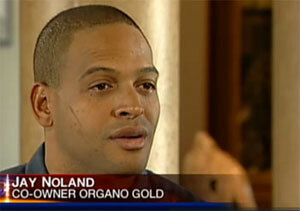 Mr Jay Noland held three separate relationships with Organo Gold. He was a co-master distributor, corporate consultant and minority shareholder. Under the advice of our corporate attorney, Mr. Noland’s distributorship and consultant duties have been terminated effectively immediately for cause, based on his personal actions of damaging and impugning the integrity of Organo Gold. Chua also demanded Noland stop referring to himself as an “Organo Gold distributor” and urged the company’s affiliates to “not get distracted”. Noland held a second Truth Sessions phonecall the day after the first, during which he challenged Chua on his letter. I didn’t feel there was anything concrete enough to take out of the hour-long phonecall, but I have timestamped Noland’s rebuttal with the call at the end of this article. Chua, Morand, Foo and Noland each hold 25% of OGE’s shares. Furthermore, directly contradicting his own words above, Chua, through the lawsuit and along with Foo and Morand ‘deny any partnership existed between themselves and Noland‘. It was up until that point that I was sitting on the fence between the two parties, but despite the acknowledgement of a partnership back in 2009, Organo Gold’s executive management were clearly being deceptive in 2012. Even without Noland’s Truth Session phonecalls, clearly the above appears to be bordering on outright lies. The structure behind Organo Gold is also revealed, with executives drawing money from ’15 Business Centers with 15 accounts (collectively the Master Distributor Accounts)’. These positions sit at the top of the Organo Gold distributor tree, collect revenue globally from the company’s distributors. I said it before and I’ll say it again, executive management participating in the compensation plan (whether passively or actively) is fishy. Separate the two and be done with it (ideally make it individually performance-based). Otherwise you wind up with the mess Organo Gold found itself in. Unfortunately I’m unaware of how the British Columbia case played out. The aforementioned judgement is the only document searchable online, with the Supreme Court of British Columbia website providing no indication as to how the case wound up. Similarly I was unable to find any further information on the lawsuit Noland claims he filed against Organo Gold and his partners. I read that apparently a suit was filed in Miami, but that’s where the trail went cold. Whether or not Noland is still a 25% shareholder and collecting a 32.5% percentage of revenue from the top position or positions at the top of Organo Gold’s compensation plan, is unclear. As for the other characters in this story? Shane Morand retained his position in Organo Gold. BusinessForHome’s “Top 100 Worldwide Earners In MLM” estimated Morand’s gross income from his Business Center position at the top of Organo Gold was $12,000,000 annually as of November 2013. Holton Buggs is now the Executive Vice-President of International sales at Organo Gold. BusinessForHome estimates his annual income from his Organo Gold Business Center position is $15,600,000 annually. Note that BusinessForHome’s chart appears to be unverified and relies on self-reporting, so I’m unsure of its accuracy. Bernard “Bernie” Chua is still the CEO of Organo Gold. He is credited on the company website as the “founder” of the company. Jamie Foo is presumably still a “silent” investor/shareholder in the company. What they earn annually from their Business Center positions is not publicly disclosed. 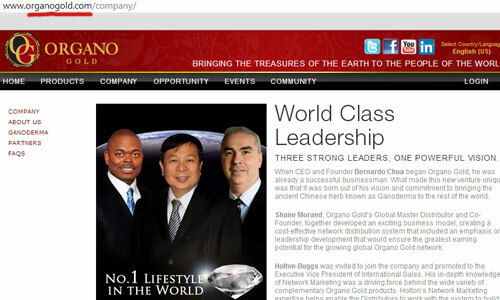 As above, Buggs, Morand and Chua are today presented Organo Gold’s “world-class leadership”. According to the British Columbia Supreme Court judgment document, Jay Noland went on to launch Serenigy “a few days” after ‘receiving notice of his termination on December 2, 2009‘. SereniGy ‘sells the same product as Organo Gold and employs many of its former personnel‘. In 2012 Noland divorced his wife Carrie Ruelle, whom he speaks highly of in the Truth Session and “lawsuit” phonecalls. Today there is no mention of Jay Noland on the Organo Gold website. During the third quarter, 2013, SereniGy will go through a restructuring process. It removed individuals from the staff whose intentions were to illegally attempt to take ownership and control from the company’s founder. This attempt did not sway the Founder’s resolve. SereniGy’s Founder and CEO, Jay Noland, has assembled a new and highly qualified executive team that is ready to take the company to unprecedented levels. I believe this was a follow-up to a now retracted BusinessForHome article, which initially claimed that the SereniGy Executive Board had “fired” Noland from his position. According to several well informed sources the Serenigy company board unanimously voted to terminate Jay Noland after Felony Embezzlement charges in Florida and after allegations taking millions from Serenigy and not paying manufactures, or distributor commissions. The new CEO is Carrie Ruelle. What happened there I’m not sure. BusinessForHome didn’t make any clarifications in their followup article (which appears to be a press-release from SereniGy). Stay tuned for a BehindMLM review of the SereniGy MLM business opportunity later this week. Organo Gold CEO Bernie Chua retrospectively rebutted some of the claims Noland made in his first Truth Sessions call, via a letter sent out to Organo Gold affiliates on December 2nd, 2009. Update 4th December 2018 – As of 2018 (probably earlier but I’m not sure exactly when), the Jay Noland Truth Sessions recordings referenced in this article are no longer publicly available. So he’s alleging that Bernie and Shane went behind his back, cut him out of Organo Gold, and conspired with Buggs to take his place, and then went Orwellian on him and scrubbed his name from the company altogether? FYI, Carrie Ruelle seem to be a MLM jumper. She was in Organo Gold, and there’s a mention that she jumped to Vidacup in December 2013 as VP of marketing. Before that she was named as “co-founder” of Organo Gold circa 2007 on MLMHelpdesk, and co-founder of SereniGy in 2011. It seems Organo Gold is really Orwellian, isn’t it? Ironically Noland claims in Truth Sessions #1 that Carrie only got back into MLM after years of avoiding it because of the “backstabbing and politics” etc. She started out by helping him with Organo Gold and then jumped in organizing their summit training events and what not. I’m kind of curious why BusinessForHome named her the new CEO of SereniGy and then retracted it so suddenly. Who fed that information to Nuyten? My understanding is many distributors of the current coffee mlm companies also branched out from DXN out of Malaysia. I’m just wondering when Starbucks will start to offer mushroom enhanced coffee. I’m almost certain they’re doing research on it. Well in that case, it just may open up a can of worms as to the legitimacy of claims that those coffees contain any Ganoderma in them. I see why many claim to not even taste the mushroom in them. I know of one company that sells bags of coffee beans “infused” with several species of mushrooms, and allegedly tastes great too. It will take someone with the proper resources to do lab tests to find any truth to the claims. David: legitimacy of claims that those coffees contain any Ganoderma in them. Thinly sliced or pulverized lingzhi (either fresh or dried) is added to a pot of boiling water, the water is then brought to a simmer, and the pot is covered; the lingzhi is then simmered for two hours. The resulting liquid is fairly bitter in taste and dark, with the more active red lingzhi more bitter than the black. The question you need to ask is… 250 mg (claimed by Morand) per sachet… of what? Original lingzhi weight? Weight of the extra? If so, how many times boiled? And HOW it is “infused” into the coffee, since coffees are ROASTED by dry heat? They probably have one or two products with SOME content of Ganoderma, enough to be listed as ingredients, enough to use the description “blend”. The EU standard for declaration of ingredients in dried food will usually require ingredients to be listed in descending order in a “weight per 100 gram” list, combined with “weight per portion”. “Enhanced” will probably not show up with any weight, but it will probably be listed near the bottom of the ingredient list. To me… for what I hear in the recordings… This guy Jay Noland is the typical “leader” with serious ego issues. His so called “Truth Sessions” sound to me like “I screwed up and now I have to convince everybody that it was not my fault sessions”, sounds like he was an angel in earth that would not harm anybody. But then you see what happens after he leaves Organo Gold, and you realize that this guy IS actually the problem when you take in notice that the previous company grows faster when he leaves, there are no more known issues between leaders, the new company that he creates called SerenGy doesnt grows even close to Organo Gold and you add that another Leadership issue pops out in the new one involving rumors of him being kicked out of his own company. For what I see, this is the typical trouble-maker “leader” that everybody has the fault but him. The story was rather complicated, and it was clearly from his own point of view. I didn’t listen to the recordings, and I only skimmed through the second half of the story. The story will be background material for a review, but it was too long to be included directly. It contained a lot of information about the inner workings of the business. 4.5 g = 4,500 mg.
organic coffee with the added bonus of pure organic Ganoderma lucidum spores. Out of those 4 examples, only one of them indicates a significant content of Ganoderma. Ganoderma was mentioned as the second ingredient in a blend. Leaving aside everything else, people people are expecting somehow to make a living, if not a fortune, by selling instant coffee (with or without magic mushrooms) in it’s most expensive form i.e. individual serve sachets, in an industry totally dominated by well funded, well connected and well established companies with squillion dollar advertising and infrastructure budgets AND no possibility of selling or reselling to commercial users. Without relying on the bulk of any income coming from recruiting, just how much instant coffee do people think they are going to be able to shift, ESPECIALLY with the added disadvantage of the fact their customer/s need to pre-order supplies in more than the single jar quantities available from so many sources. It would be like someone trying to make a living selling one of the most popular and heavily advertised beverages on the planet such as Coca Cola or Pepsi, in high priced carton lots which have to be pre-ordered. A classic example of the companies’ turnover having no relevance to income potential of IBOs. 5Linx jumped into the healthy coffee field with “MontaVida” coffee. Was going to finish the SereniGy review today but for some reason the “opportunity” section of the SereniGy website is broken (404). Given there’s an official PDF compensation plan I’d rather not rely on YouTube presentations so I guess I’ll check back next week. This has pretty much been my take on the whole thing as well. Doesn’t appear to be any satisfactory closure in the matter since we’ve only been hearing one side of the story. Jay’s. And OG does appear to be on an upward path at the moment. Jay it is so unfair..I get how you must feel about this situation but stand tall and fight for what’s right and Dont Give Up. I tried to even look for the website of sereniGY to purchase or add to my coffee company and keep getting switch to Rain page..
have they merge with another company? talks about healthy supplements and not coffee. Serenigy merged with Rain International mid last year. I worked with JD Noland from around 1997-1998. Karma is all I can say and I was not without fault. It always comes back to get you. Good luck to you. Indeed Oz, Serenigy is now part of Rain Intl. Does that say something about the quality of that company or its leadership? (Byron Belka, Casey Whitaker, …). Does that say something about the quality of that company or its leadership? (Byron Belka, Casey Whitaker, …). You’d have to research the individuals in question. Does someone know anything about a company called “Success By Health”? They company tries to make a “market” in Sweden as we speak. The founder is to be Jay Noland. What to think? SBH = Success By Health. I’ve added Success By Health to the review list.